We can’t think of anything better than that, Jerry. Well, except ending the evening with a Ghosts and Gravestones tour! For those of us not fluent in Irish, Lá Fhéile Pádraig means St. Patrick’s Day. Did you know the second largest St. Patrick’s Day celebration in the United States takes place right here in Savannah? Yep, as if you need another reason to visit our magical city. Since 1813 the city of Savannah has been celebrating the feast day of Ireland’s most famous saint. Nearly 400,000 folks will take part in this year’s festivities. The day begins with mass at the Cathedral of St. John the Baptist at 8:15. The parade begins at 10:15 on Abercorn Street (between Gwinnett and Hall) and snakes (no pun intended since St. Patrick is rumored to have driven the snakes out of Ireland) its way around the historic district down Broughton, Bay and Bull Streets. Come join us at Savannah tours and be Irish for the day! Key West is known for all things Conch. If you are born here, you are a Conch. If you live hear for seven years or more you’re a fresh water conch. Our signature dish is is the conch fritter, the local football team are called the Fighting Conchs and the drill team the Conchettes. We live in the Conch Republic. In addition to providing us with delicious food, if you cut off the tip you can use it as a musical instrument For 48 years running the city has held a conch shell blowing contest and this year, it was won by our colleague, Clinton Curry, a sixth generation Conch, who is the general manager of the Key West Shipwreck Treasures Musuem. Congrats Clinton! The Studios of Key West is a marvelous cultural center that features classes, studios for artist, lectures, exhibitions and concerts. Located in the historic Armory Building on White Street, the TSKW and is the anchor for the monthly Walk on White events. Our little island is very fortunate to have such incredible group and facility in our community. 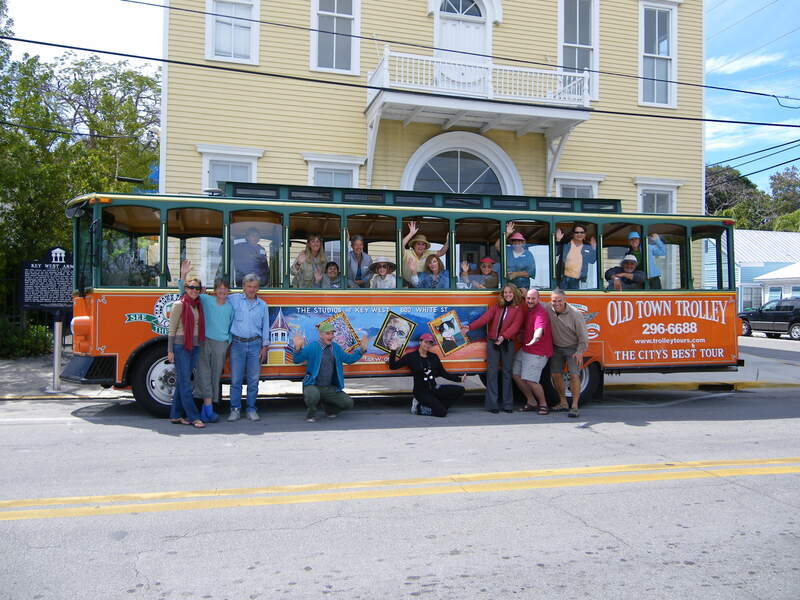 Old Town Trolley Tours is proud to be a sponsor of TSKW and we have a trolley that has a special TSKW billboard on it designed by local artist Marc Caren. Yesterday, we too the plein air class out to the beach which was the perfect opportunity to get the trolley with the students and artists at the Armory. 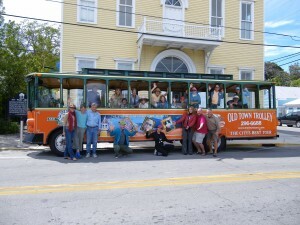 You are currently browsing the Old Town Trolley Tours Blog blog archives for March, 2010.